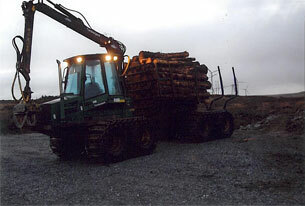 Our harvester is fitted with the new John Deere engine boosting efficiency. This machine also provides the operatives with better visibility, designed to work at it's best in select thinning and regeneration harvesting. The unique balanced bogie, combined with a low centre of gravity, advanced transmission system and wide tyres provide excellent tractive force and reduced ground impact and like all our forestry equipment the 1070 is not only productive but an environmentally sound machine. 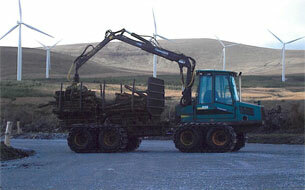 Fitted with a robust 762C Harvesting Head ideal for late thinning's and regeneration harvesting. This is a highly automated harvesting head: harvesting head tilt up, pressure adjusted delimbing knives and feed rollers, stem feed, colour marking and stump treatment all adjustable via the computer system. 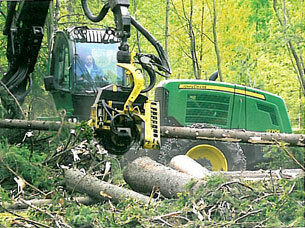 The 810-B is the smallest forwarder in the family and is ideal for logging in dense thinning areas. This machine is equipped with eight wheels, has a very compact turning radius and is designed for sensitive applications where size is an important factor. However despite its size this machine is rigged out with all the technological benefits required to make this a very productive and environmentally sound piece of kit. 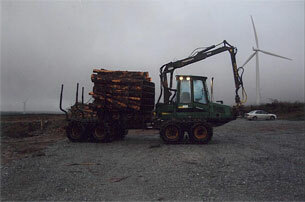 The 810-B forwarder have low emissions, excellent level tractive forces and reduced ground impact, with advanced control systems and visibility these machines are highly productive and environmentally sound, operating easily even in the toughest forest terrain. We are able to offer hand-cutting services provided by qualified and experienced personnel. All of our operatives are fully trained, certificated, insured and highly experienced in all aspects of Forestry, Tree operations, and Line Clearance. Most have first aid training.